Two Bears Farm and the Three Cubs: 3-2-1 Penguins! Our family recently received the complete season of 3-2-1 Penguins! for review. Since we don't receive any tv channels, I had never heard of the show (although it had four highly rated seasons on NBC as a Saturday morning cartoon), so I didn't know what to expect. I was pleasantly surprised and amused by the program. The gist of the story is that 8 year old twins Michelle and Jason go to spend part of the summer with their Grandmum. While there, they discover the attic, and when Jason crams 4 figurine penguins into a rocket ship it takes off and flies into the air. 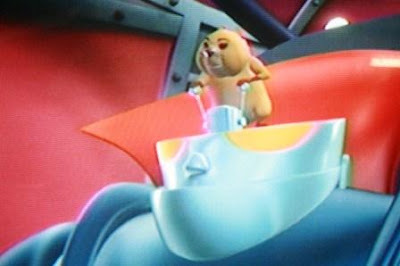 The penguins (Zidgel, Midgel, Fidgel and Kevin) are the crew of the spaceship and shrink Jason, scooping him inside the rocket for an adventure. The beauty of each adventure is that while in space the twins always learn a moral lesson dealing with some sort of dilemma they were having during the start of the show. Lessons that are totally real for my kids - things like sharing and taking turns. Pierce wanted to be Baron von Cavitus so badly. So he came up with an idea. 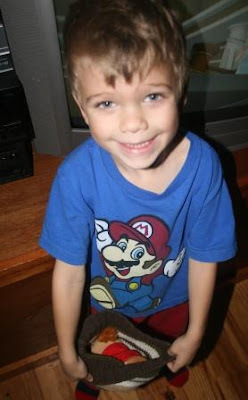 He put his stuffed Alvin the Chipmunk inside a hat. Behold, Baron von Cavitus, right in my living room! In case you want to see the real thing, I took a picture of him on my television. He can slide the robot head back to reveal himself, although he prefers to have the robot head on so he can talk in his creepy voice and no one will call him cute. His favorite snack? Radioactive raspberry ice cream of course! Seriously, this is a great cartoon - even I got pulled into it. Running time is 4 hours 46 minutes, and it retails for $19.97. Each episode runs 22 minutes, and the dvd set includes 13 episodes. If you're looking for the sort of cartoon that teaches wholesome morals but involves plenty of fun action and humor, this is an excellent choice. WHat a great DVD!! I need to get it! I never heard of that show either but it sounds GREAt! Pierce is a little cutie! His version made me giggle! Sounds like a silly and creative little cartoon. No wonder you all like it! I love it when shows ignite children's imagination like this has your son's. That does sound fun! We don't have very many TV options. It's either PBS kids, or DVDS for our kids. I haven't heard of this one. Sounds like a flick boys would like! How cute! I love that he put his Alvin in his hat. I am not familiar either. I always love your photos.....so sweet! 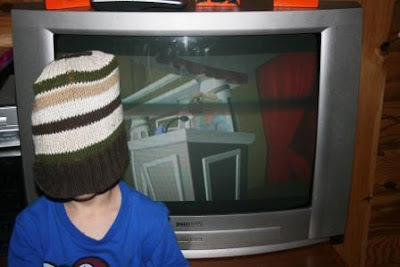 Isn't it great when the kids find a "GOOD" show to enjoy? That's how I always felt about "Fetch" and "Cyber Chase." I always loved shows that were captivating and inspired creative play too! This show sounds like a winner! Oh to have little kids again! I just loved watching kids shows and movies. Sounds like a cute show! PS - I love Pierce's Mario shirt! Seems like it's very imaginative with a good message! So cute! It's funny, I work hard to limit my kids' TV time, but I always love it when they discover a great, new show. Thanks for the recommendation! Never heard of it, but all smiles here because your boys are so cute! Love that it teaches the boys something valuable. Pierce is a hoot.